After an unexpected nero yesterday, I took a bit of time to get out of the hostel and onto trail. The Colorado Trail House is one of the nicest places that I have stayed at. It is run by a couple of past AT Thru Hikers and is cheap and exactly what I want in accomodation. I eat the included breakfast of eggs and toast and then started the long road walk back to the trail. Was somewhere along the 2.5hrs of road walking that I questioned my decision of walking into Leadville the other day. And my desire for continuous footsteps. When I finally got back on trail, I was greeted with a beautiful trail that slowly went downhill from the pass. This little section also contained a guided group of 300 people from Switzerland. I was a little lucky that I reached them as we were walking along a wide dirt road, and therefore they were fun to talk to and easy to pass. It was then time for one of the nicest climbs to date. It had an exquisite view of the valley behind and was a perfect gradient that I could climb with relative ease. There were also a lot of people that were hiking the Colorado Trail Southbound that I got to say hi to along the way. I reached the top of the pass at 12,500ft (3,800m) and was greeted with some nasty looking clouds that looked like they had the potential to thunder. I had not had a break for 6 or 7 hours by this stage and was desperate to stop and eat, but I also did not want to get stuck in a lightning storm so pressed on. It was somehow both senic and contained an interesting mine that had torn a slope away. Even though I am an road construction engineer, it still dumbfounds me how much soil machines can move, and the scar on the landscape that is left. About an hour after reaching the pass the clouds started to clear without any impact. I ran into one of the million Australians hiking (seriously, one night we had 7 people from AUS and 2 from the States). I sat down with her to eat and and catch up with how she has been over the last couple of week since we first met. On the topic of people. 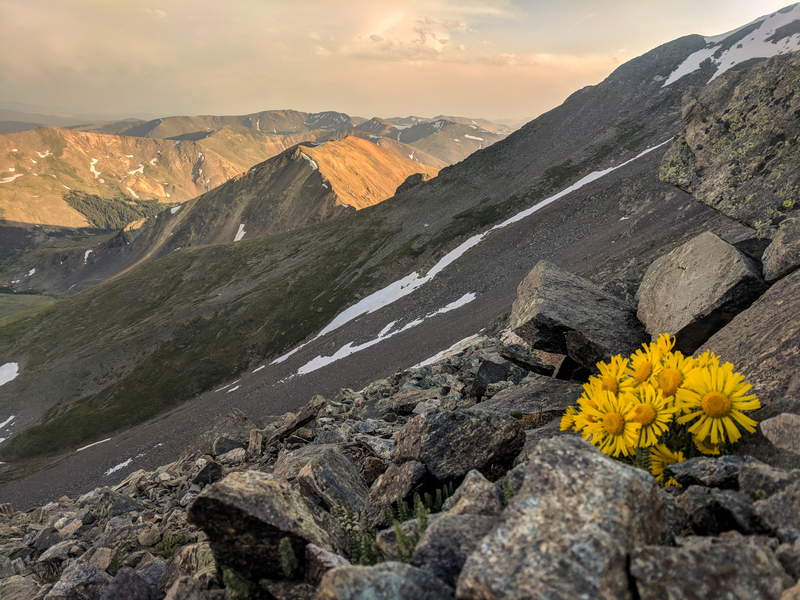 I am also surprised that the CDT has got from a solitary New Mexico experience where I hardly saw anyone to Colorado where I run into Thru Hikers every day. After a 30 minute break I packed up and l continued the descent into Cooper Ski Resort. I was thinking that I would get a cheeky dinner from one of the restaurants but about a mile out I thought that I would get a better sleep in the woods and I can get a hot breakfast instead. I was lucky to find a nice flat spot skirting the ridge and set up camp. There were actually some devils, I mean mosquitos, so I put up my bug netting for the first time since Oregon on the PCT so many months ago. It has been a real pleasure not having to deal with them for so long. I’m scared of two things on trail, lightning and mosquitoes!